Tell the time in style with this fantastic men’s Emporio Armani AR5866 stainless steel watch. Featuring a black rubber strap, black face and black dial, this is a sharp and sleek accessory for a fashionable gentleman, and the perfect watch for all occasions. 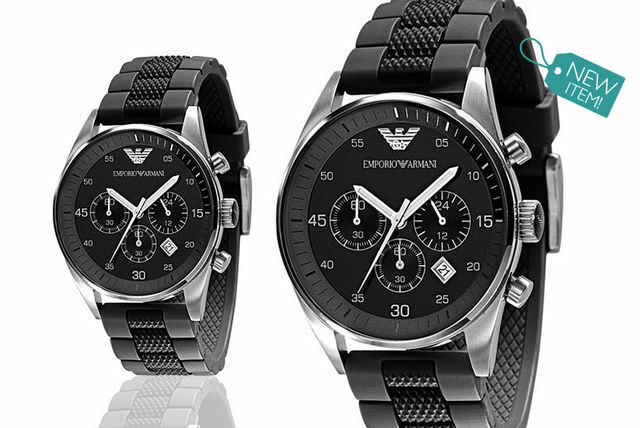 Get a men’s Emporio Armani AR5866 stainless steel watch. Features a stylish black rubber strap, black dial and three subdials. The perfect everyday watch to match with all your favourite outfits. Comes in a presentation box – a great gift for a special person! It has white second and minute hand markers, three subdials and a date display, and also comes in a presentation box, making it the perfect gift for a special person. So hurry up and redeem today before time runs out on this deal!